Three new Campaign missions for an extended solo experience. Inserted in Russia and Kazakhstan, the Ghost must take part to one of their most classified mission. "Secure Dawn": A plane transporting a highly valuable VIP has been shot down over a forested area next to the Russian border. A distress beacon has been received. The Ghosts deploy to find the VIP and safely extract him. "Cold Walker": High Command tracked a Raven Rock mobile command center inside a train depot, deep in the heart of Russia. The Ghosts are deployed to locate and acquire precious intel assets. "Argent Thunder": Bodark Officers are on the loose in the city of Moscow. 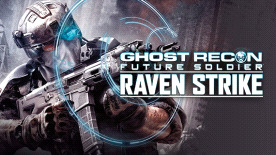 The Ghosts are sent out to eliminate 4 Raven Rock VIPs trying to trigger a nationalist uprising in the city. New Guerrilla map: "Sawmill". Rising fog can turn the dense woods and open areas of this timber camp into a deathtrap.